New fan from Yate Loon. Strong airflow and super-quiet operation speak for this 120mm axial fan with a bronze bearing. The fan can be connected to the PSU via a Molex plug (with adaptor, sold separately) or directly to the Mainboard. The fan is ideal for the super silent operation when operated at <7V. Thanks to the extra long connection cable of approx. 60cm th fan can also be used in very large cases (e.g. Server or Big-tower) and still be properly wired without using cable extensions. The fan is an absolute highlight for modders! The red LEDs give a unique touch to any case. 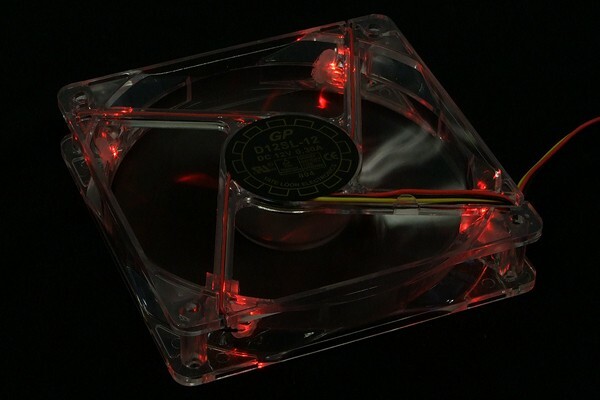 The transparent frame allows the fan to look just like any other fan in daylight, but in the dark it will reveal its feature when in operation!